University of Pittsburgh Press, 9780822964544, 128pp. For the Scribe, the ninth collection by award-winning poet David Wojahn, continues his explorations of the interstices between the public and the private, the historical and the personal. Poems of recollection and elegy commingle and conjoin with poems which address larger matters of historical and ecological import. The subjects of extinction and apocalypse figure prominently and obsessively in these pages, both in short lyrics and in several lengthy sequences. The poems also evidence the mastery of technique for which Wojahn is renowned, whether he is writing in fixed forms or in free verse. 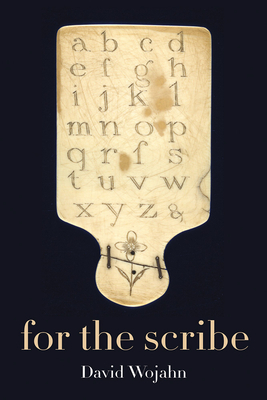 For the Scribe is the most ambitious and searching collection thus far from a poet who has been a named finalist for the Pulitzer Prize in poetry, winner of the Lenore Marshall Prize from the Academy of American Poets, the O. B. Hardison Award from the Folger Shakespeare Library, and the William Carlos Williams Book Award. David Wojahn is professor of English at Virginia Commonwealth University and also teaches in the MFA in Writing Program of the Vermont College of Fine Arts. He is the author of Spirit Cabinet, The Falling Hour, Late Empire, Mystery Train, Glassworks, Icehouse Lights, and Interrogation Palace, which was a finalist for the Pulitzer Prize. Wojahn is the recipient of four Pushcart Prizes, the William Carlos Williams Book Award, the Carole Weinstein Poetry Prize, the George Kent Memorial Prize, and the O. B. Hardison Jr. Poetry Prize, among other honors. He has received fellowships from the Guggenheim Foundation and the National Endowment for the Arts. "In his formidable ninth collection, Wojahn (World Tree) catalogues extinctions personal, cultural, and ecological. 'Assume, dear vagabond, you are permitted/ One last survey,' he writes in the opening poem, an elegy for his father. As longtime readers might expect, Wojahn’s own 'last survey' impresses with both its diversity and detail. Bristling with quotations and historical artifacts, his rhythmic lines capture bluesmen as well as they do woodpeckers. In the title poem, he writes 'inscription/ Is a form of weaving,' and indeed, his brocaded compositions often have the richness of tapestry. Whether examining Glenn Beck or laundry robots, his 'burnished effusions' relentlessly hone in on the specific. In a book so focused on death and violence, such specificity can grow exhausting, even ghoulish, as in one voyeuristic sequence about lynching. But at his best—in heartfelt laments for other poets, and unhinged fantasias that put Elizabeth Bishop, Robert Johnson, and Ronald Reagan in conversation—Wojahn moves and fascinates, drawing readerly attention to the 'auguries of apocalypse' all around, however 'small in scale.' 'God of stench & musk,' Wojahn writes in one gloriously open poem about Pan and Xanax, 'how well you know our recent century/ where art & terror have so freely & relentlessly conjoined.'" "Recipient of numerous accolades and author of nearly a dozen books, Wojahn (World Tree) delivers a sophisticated, meticulously erudite collection. Most prominent is a series of baroque mash-ups, in which he mediates on two seemingly disparate yet intricately connected entities or ideas: 'Paradise Lost' and a history of the noose; music producer turned murderer Phil Spector and Incan death rites; the evolution of wolves into dogs and drones over Waziristan. One especially moving example blends an elegy for the poet Reginald Shepherd with a long walk through museum taxidermy: 'There you are, pinned in the lyric distance, small point of reference I call love.' The remainder of the book is packed with scattered curiosities and odd novelties, examined by a poetic, insatiable persona, taking up FOXP2 (a gene linked to speech); Nim Chimpsky (one of the first chimpanzees to learn American Sign Language); and Gar.Una of Uruk (the first recorded signature, from 5,000 years ago). A work of extraordinary range and grace."